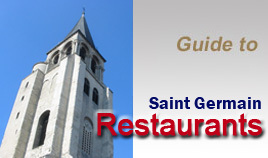 Saint Germain des Pres : Some of the world's finest cuisine can be found in Paris. We have listed the best places to dine in Paris : Be sure you hit the best restaurants or the best bargains for food while you are there. Paris cafes are possibly the most well-known image of the City of Light.